Working for free, but not cheaply « Hercules and the umpire. Credit: pcambraf’s photostream per Creative Commons license. As a senior judge, I could quit today, and the government would continue to pay my salary. Or, if I like, I can continue to work even though I am not required to do so to receive my salary. Like many others (who are far better judges than me), I work for free. I don’t deserve a pat on the back–I like what I do and am happy to do it. 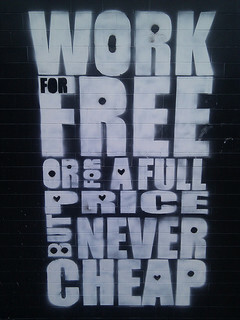 But, as the sign says, I don’t work cheaply. Today, Congress approved a budget fix so that you and others can fly around the country secure in that knowledge that the air traffic controllers will be at work rather than on furlough. Then you scurried away to catch your flights home. Yet you are knowingly and wilfully failing to appropriate the funds necessary for the federal courts to perform their core functions. What is it about the word hypocrisy that you don’t understand? Have you no shame? *Unlike active judges who are constrained by all sorts of things, I don’t have much to lose by speaking my mind. « What does it really mean to be a “senior status” federal district judge?